GLENDALE, Ariz. — The last time the New England Patriots played a Super Bowl in the Arizona desert, it was a most unlikely hero who made the play of the game, a play that broke the Patriots’ backs. This time the Patriots returned to the desert for Super Bowl XLIX, and it was again a most unlikely hero who made the play of the game, this time the play that delivered Lombardi Trophy No. 4 to New England. The Patriots beat the Seattle Seahawks, 28-24, to reclaim the title of NFL champions thanks to an end-zone interception by undrafted rookie cornerback Malcolm Butler. The interception capped an impressive second-half comeback by the Patriots, who seemed to be in control in the first half, only to rather quickly fall behind by 10 points in the third quarter. But the improved defense, the one lauded all season as the best New England has fielded in a decade, once again shut out the opponent in the fourth quarter and the offense regrouped from some miscues to string together two fourth-quarter touchdowns. 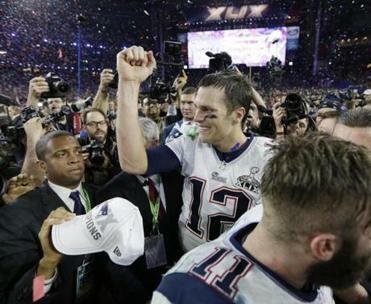 Super Bowl MVP Tom Brady set multiple records in a thrilling finish. “I couldn’t be prouder of this team,” said Bill Belichick, just the second coach in NFL history to lead his team to four Super Bowl victories, joining Chuck Noll. “These guys have been counted out many times through the course of the year by a lot of people but they always believed in themselves and just kept fighting. Over the final nine games of their season, dating to their Nov. 23 win over Detroit, the Patriots’ defense allowed just 12 fourth-quarter points, including final-frame shutouts of the Colts in the AFC title game and the Seahawks. Conversely, Seattle hadn’t surrendered more than 7 fourth-quarter points in a game since its Week 5 loss to Dallas. “We knew it was going to be tough and we knew it was going to come down to minutes or even seconds in the ballgame because they are a great football team,” defensive lineman Vince Wilfork said. “I’m a defensive guy — to win on a defensive note, that is the most amazing feeling you can have. Facing second and goal from the 1, the Seahawks made the stunning decision to pass the ball rather than hand it off to power back Marshawn Lynch. Russell Wilson (12 for 21 for 247 yards, two touchdowns, interception) threw the ball into traffic, and Butler, who a little more than a year ago was playing for West Alabama, stepped in front of the intended receiver, Ricardo Lockette, for the play of his young career. Seattle coach Pete Carroll, whose team was trying to become the first back-to-back champion since the Patriots in 2003-04, took responsibility for the call to pass on second down, figuring they would run on third or fourth down. Butler, who said the Patriots were the only team to offer him a contract, knew a pass was coming, crediting defensive coordinator Matt Patricia with getting his players ready. Butler has impressed the coaching staff and his teammates since the spring, and all of the New England defensive backs were singing his praises, saying the Mississippi native has been making plays in practice and in games since the day he arrived in Foxborough. Butler’s play came just moments after it seemed like the Patriots’ championship dreams would be crushed by another miracle catch, as they were years earlier in this same building by the Giants’ David Tyree. Jermaine Kearse and Butler both rose for Wilson’s sideline pass, and as both fell to the grass, the ball came down, hitting Kearse between the legs. It popped up, Kearse batted it up, and he was amazingly able to secure the ball. It never touched the ground, making it a legal reception. Now with first and goal at the 5, Wilson handed off to Lynch, who picked up 4 yards. But on second down and just feet to the goal line, rather than give their Pro Bowl back the ball again, Seattle opted to have Wilson pass. New England became the sixth franchise in NFL history to win at least four Super Bowls, joining the Steelers, Cowboys, Giants, Packers, and 49ers. The Patriots also are the first team to come back from a 10-point second-half Super Bowl deficit and win. The winning touchdown came with 2:02 to play, a 3-yard Tom Brady-to-Julian Edelman pass, Brady looking to his most trusted receiver when it mattered most. Edelman finished the game with nine receptions for 109 yards and the score. Brady, the first quarterback to start six Super Bowls and who was chosen as the game’s Most Valuable Player, set a slew of records in the win: his 37 completions (he was 37 for 50 for 328 yards, four touchdowns, and two interceptions) were a Super Bowl record; his 13 Super Bowl touchdown passes put him past his childhood idol, Joe Montana, who had 11; and he became the first quarterback in league history with 50 touchdowns in the postseason. He is the sixth QB to throw four or more touchdowns in the Super Bowl but the first to have them go to four different receivers. Edelman, Rob Gronkowski, Danny Amendola, and Brandon LaFell were the lucky quartet. But Brady, who fought a cold and continued to hear questions about the team’s alleged deflated footballs in the AFC Championship game all week, and seemed more relieved than exhilarated when at his postgame news conference, gave the credit to every one of his teammates. “It’s just a lot of mental toughness. I think the whole team had it,” he said. “Coach [Belichick] always says, ‘Ignore the noise and control what you can control.’ We had two great weeks of practice; that’s what it took, and every situation that came up was important. Seahawks’ final play call: What were they thinking?